Strontium Dog, Titan Books (1987) | 'TAIN'T THE MEAT… IT'S THE HUMANITY! Strontium Dog originally appeared in Starlord comic (the sister title to 2000AD) which launched in May 1978. When the new title faltered after only 22 issues it was folded into its better selling sibling to form 2000AD and Starlord. Strontium Dog had proved popular with readers of Starlord so the strip also migrated over to 2000AD where the character has enjoyed a long tenure on the title. Created by John Wagner and Carlos Ezquerra, who also created 2000AD‘s most iconic character, Judge Dredd, Strontium Dog chronicles the adventures of future bounty-hunter Johnny Alpha, and his loyal companion Wulf. Alpha, born a mutant thanks to a recent atomic war on Earth, is treated as an outcast by society and works in the only profession open his kind: bounty-hunting. Equal parts spaghetti western and sci-fi adventure Strontium Dog was a terrific read thanks to Wagner’s taut and humorous writing and Ezquerra’s wonderfully detailed artwork. 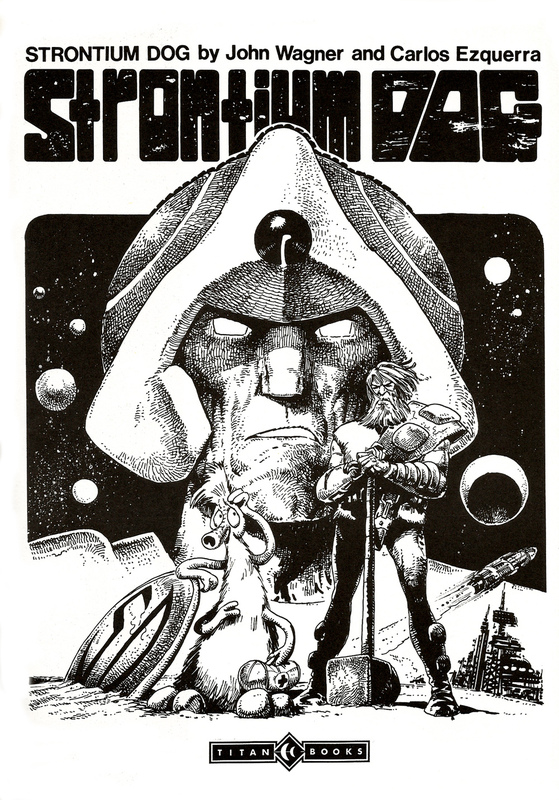 A collected edition of reprinted Strontium Dog material was published by Titan Books in 1987. The book contained 64 black and white pages with a full colour board cover illustrated by Ezquerra, and the book sold for £4.95 ($9.95). The volume featured 11 stories reprinted from the first 15 issues of Starlord, and feature the earliest strips to star the character. Also included was an introduction by 2000AD Editor Steve MacManus, a pin-up by Ezquerra and three reprinted covers taken from Starlord issues #4 and #13 and 2000AD Prog #339. During the 1980’s Titan Books published dozens of reprint collection featuring 2000AD characters. 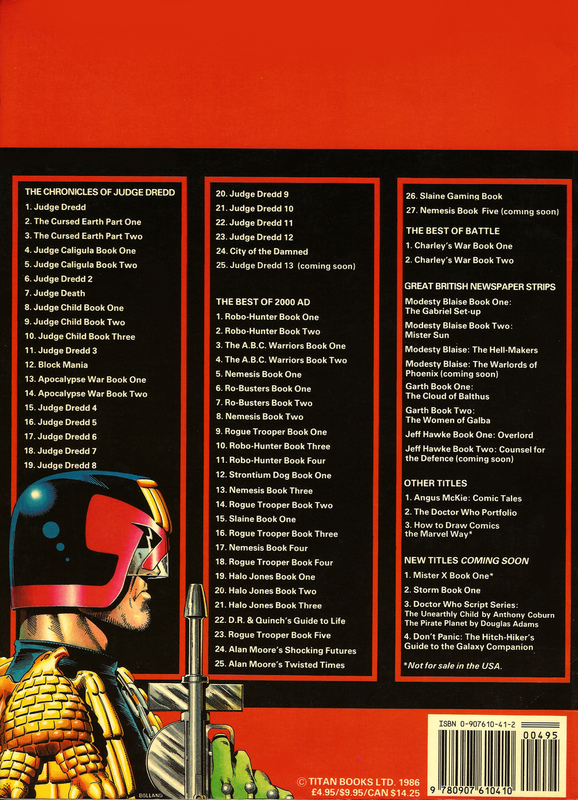 Unsurprisingly Judge Dredd proved the most popular, appearing in over 40 collections. Other characters such as Robo-Hunter, The A.B.C Warriors, Ro-Busters, Rogue Trooper and Nemesis The Warlock also received the reprint treatment, with many appearing in several volumes. 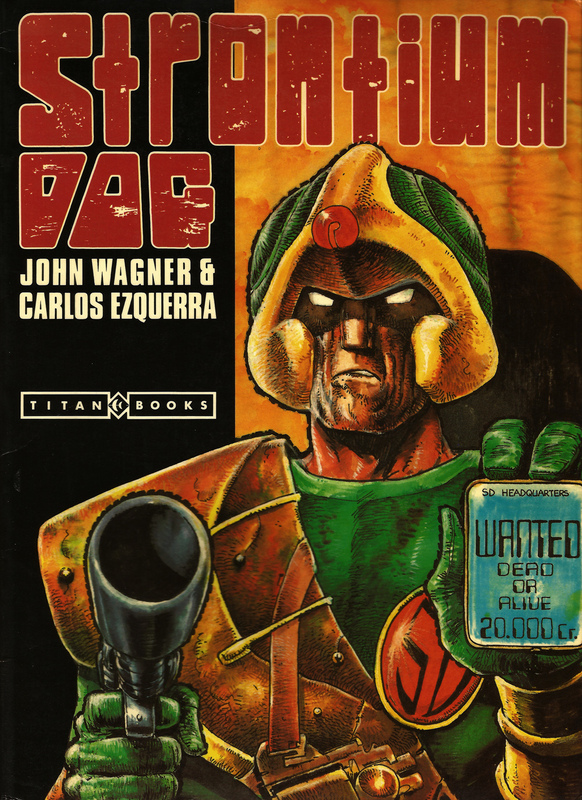 Sadly Strontium Dog only appeared in this one collection – I can’t say why for sure as the character was popular and the collection is a solid read. These early strips quickly establish the environment in which Alpha and Wulf struggle to survive, while pitching the characters against some truly memorable adversaries (who can forget Papa Por-ka). The pair’s treatment as outcasts and pariahs also adds a nice touch of social commentary and we also get to meet The Gronk, the frail alien who first befriends, and then adorns, Wulf. Collectors of these Titans reprints from the Eighties (published under the umbrella title Best of 2000AD) can still find second-hand copies of this collection for around a tenner. Fans of the strip should also check out Rebellion’s excellent four volume collection, Strontium Dog: Search/Destroy Agency Files, which reprint all of Alpha’s earliest (and best) strips.